The males are easily discerned from the females by their glittering, ultramarine blue throat which is characteristic of hillstar males. Their heads are an iridescent emerald green with blue-green reflections that extends down their back. Under the triangular blue throat is a velvet black collar separating the iridescent feathers from the pure white chest with a vertical black stripe rising from the base and ending a centimetre below the collar. The females’ head and back are more bronze-green than emerald, and their throats are spotted with small circular feathers of this colour. Underneath these and down their chest are olive-green feathers. The bill is black with a slight curve, the legs and claws are also black. Their eyes are dark brown and have a small white spot on the outer corner. 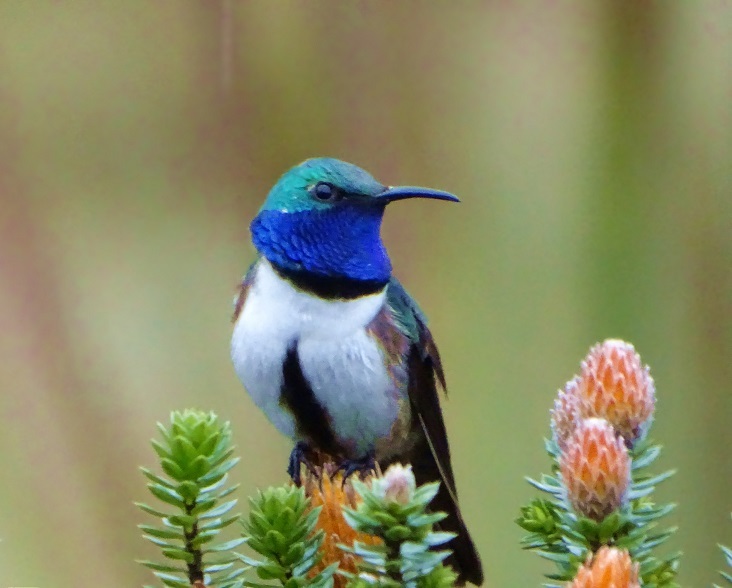 The Blue-throated Hillstar have been observed feeding in patches of shrubs within their páramo habitat. They feed on the nectar of flowering shrubs. The main feeding plant is Chuquiraga jussieui, an evergreen shrub with orange flowers. Hillstars are less reliant on flight than other hummingbirds because the air is so thin, so they tend to feed by clinging sideways or upside down to the shrub, but also perching next to the flowers. They can consume up to double its weight in nectar. 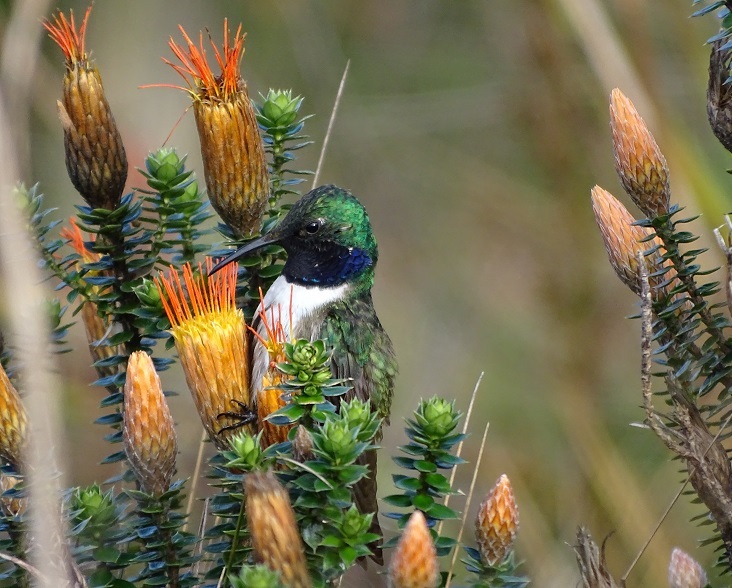 They are quite shy and cautious compared to other hummingbird species when feeding on mutual flowering stands, often being chased away by dominant species such as Shining Sunbeam. When they are not feeding, the Blue-throated Hillstars perch on lichen-laden rocks and boulders, often close to the ground or small streams. At night they cope with the low temperatures by entering a state of hibernation called torpor, when their high metabolism slows and their heart rate drops. 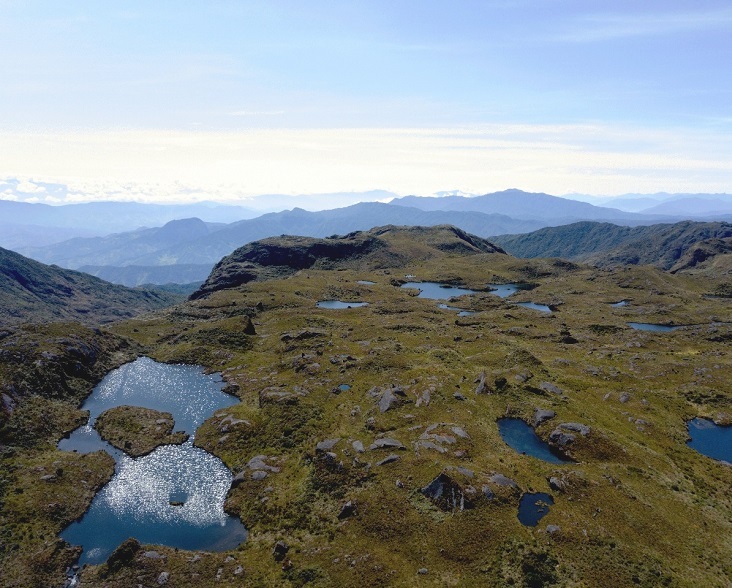 The habitat of the Blue-throated Hillstar is the páramo of the western Andes, an eco-region above the forest line but below the snow line. The páramo is home to many striking examples of Andean wildlife and because of its unique species it is referred to as an evolutionary hotspot. This hillstar has a very limited range, restricted to a few mountaintops in the Loja province of southern Ecuador. Although the IUCN have not yet assessed the Blue-throated Hillstar so it is not included in the IUCN Red List, the researchers who discovered the species have evaluated it as critically endangered under IUCN criteria. Its highly restricted distribution (an optimistic estimate of its range is 100 km2) and small population (only 250-750 individuals) makes it highly vulnerable to habitat loss. Without land protection, its habitat is threatened by mining, manmade fires and encroachment from non-native species from nearby pine plantations. 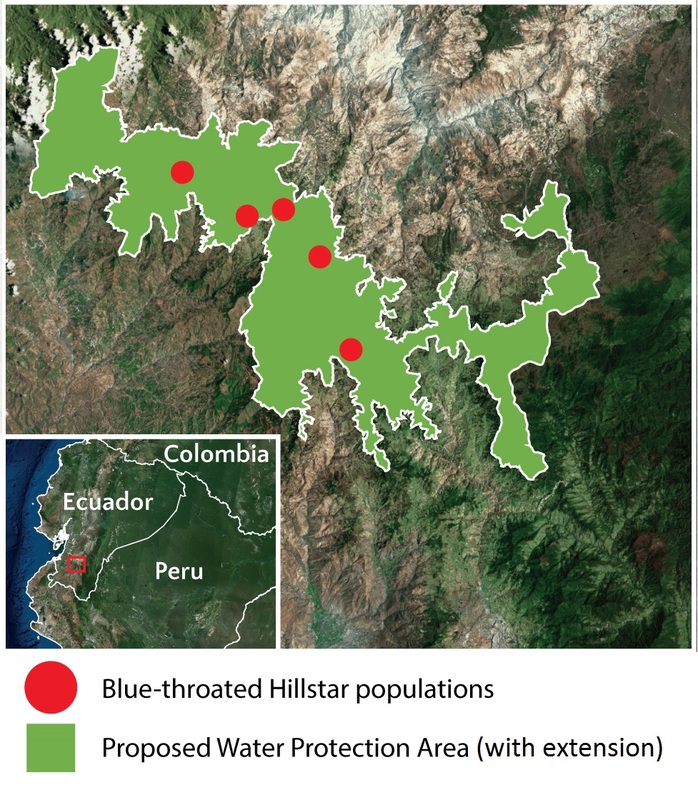 In February 2019, WLT launched the Save the Blue-throated Hillstar appeal to enable NCE to extend a Water Protection Area to include the hillstar’s 70,000 acre range. By incorporating the hillstar’s habitat, it will have government-level protection and will be safe from mining. Sornoza-Molina, Francisco, et al. “A striking, critically endangered, new species of hillstar (Trochilidae: Oreotrochilus) from the southwestern Andes of Ecuador.” The Auk: Ornithological Advances 135.4 (2018): 1146-1171.